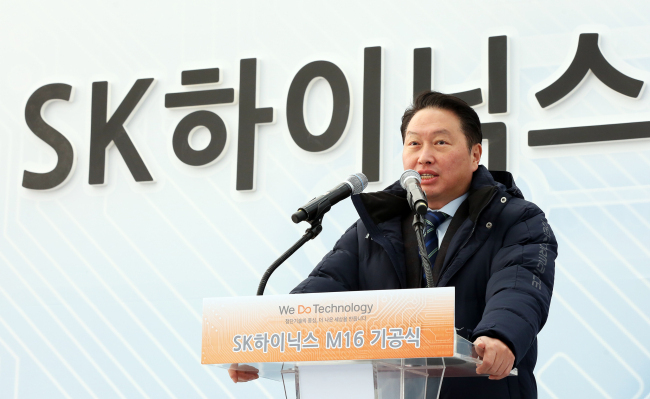 SK Group Chairman Chey Tae-won on Thursday hinted its semiconductor business could expand into the non-memory semiconductor market in order to diversify profits and raise future competitiveness in the fourth industrial revolution era. “We don’t yet have any set plan but we will have to do something this year,” said Chey in response to The Korea Herald’s question about SK hynix’s preparations for the system-on-chip market, in a similar move by Samsung Electronics. South Korean chipmakers that are leading the world’s memory market are now apparently considering their expansion into the non-memory market, a move that was highlighted during the talks with President Moon Jae-in last month. President Moon has been showing his interest in the non-memory market, mainly including high-tech computing processor units that are key to machine learning, hoping to see the Korean chip firms make new investments in new technologies. Regarding the specific type of non-memory semiconductors needed for automobiles, Park said, “The ones SK hynix are developing technologically go beyond application processors,” hinting that they could include the most cutting-edge SoCs such as graphics processing units and neural processing unit processors that are core chips for self-driving cars.